When you are just starting out in your new drone services business, the last thing you want to be thinking about is accidents, crashes, or emergency situations. It’s not fun to think about and we all hope it never happens, however, it’s something you need to consider. This line of work has an inherent risk due to the use of flying objects (aka your drone) and the fast and dangerous propellers that keep it airborne. Beyond that, some of the work you do will be used to make decisions which may affect a company’s operations. It’s very important to ensure you and your company are protected. Depending on the location, type of work, equipment you are using, and inherent risk, it’s highly recommended and in most cases mandatory to carry insurance. Drone insurance is a very new in the insurance world, having been around for only a couple of years, it is only now becoming more mainstream. When looking into drone insurance, there are many different options and policy types to consider. First, you must understand the two primary types of drone insurance. There is liability insurance and then there is hull damage insurance. Hull damage will insure an damage done to your equipment in the case of an accident. Liability insures any damage that you or your drone may have caused in the event of an accident. If you are operating commercially, it is good to have both types of insurance, but, liability is the most important. When it comes to finding an insurance plan, there are two options. One, you can have a annual plan that is typically paid monthly and will cover your business for all your flights. This is highly recommended if you are flying on a regular basis and flying drones is your primary source of income. This may also be required for contracts with larger companies if they require you to have a minimum level of liability insurance. In our experience we have found that larger companies usually require a minimum of $2 million in liability coverage. The disadvantage of this type of insurance is if you are only doing a few flights a month then your costs for operating may be higher than your income. These policies can be sourced through an insurance broker, such as SkyVuze, or directly underwritten by companies like AIG. For an annual plan, it can range from $400 to $3000 a year depending on your fleet, experience, frequency of use, and liability coverage you desire. We have also seen that insurance companies do provide discounted rates for pilots that have been certified or trained in flight safety and can provide some sort of certificate verifying this training. A new type of insurance policy emerged in the industry after companies started noticing that most pilots didn’t need annual coverage since they were not flying everyday. This brings us to our second type of insurance, on-demand or per flight insurance policies, which can be as low as $10 per flight and will insure you for whatever time frame you need. It could be as little as 30 minutes or as long as 5 days. 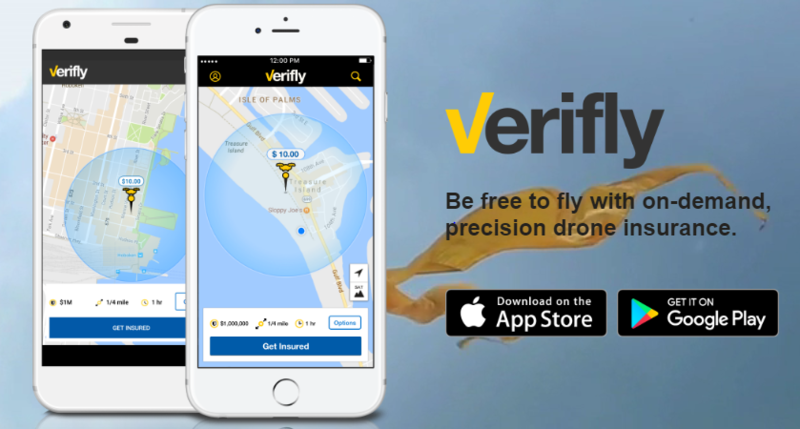 One of the primary companies offering this service is Verifly. What is great about Verifly is that it designed to grow with you until you are ready for an annual policy. If you are just starting out and have 1 or 2 customers a month Verifly is the most cost effective solution for your business. But if you start getting more and more customers, which is always a good sign, and now are flying 3 to 4 days a week, paying for each flight can get costly. With Verifly you are not stuck in a contract, when you are ready to step up to the next level you have the freedom to call a company like SkyVuze and have them set you up. One of the issues we have found with the on demand insurance policy is that it may not be acceptable for some larger companies or contracts that will want to see a more permanent insurance policy. Although if you are stepping into conversations with some larger companies it may be a good indicator that it is time for an annual policy. Now that you know the different types of insurance, what is next? I would first highly recommend you decide where you fall when it comes to your flight activity. If you are unsure or on the fence we highly recommend just starting off with on-demand as it will be cost effective and really give you a good idea of what you need. If you know that on-demand is going to be too expensive because you are just booked up every week and dont have the time to get multiple quotes then finding a insurance broker like SkyVuze is your best option. These guys are great and we have personally used them for our company, they will source out multiple quotes and tell you the pros and cons to each company. Time is money and we don’t have the time talk to each of these companies because we would rather be making money flying. But if you have the time to spend sourcing out multiple quotes then start with these 3 companies AIG, Global Aerospace, and Lloyds. In conclusion, it is almost impossible these days to operate a drone legally without some sort of liability insurance. It may be a good idea as well to have hull insurance depending on your flight experience, equipment cost, and capital backing. If you have additional questions on drone insurance that we did not cover above please feel free to reach out to us.